Some of my trips involve multiple days of travel to the final destination. It is no fun flying for 32 hours straight! 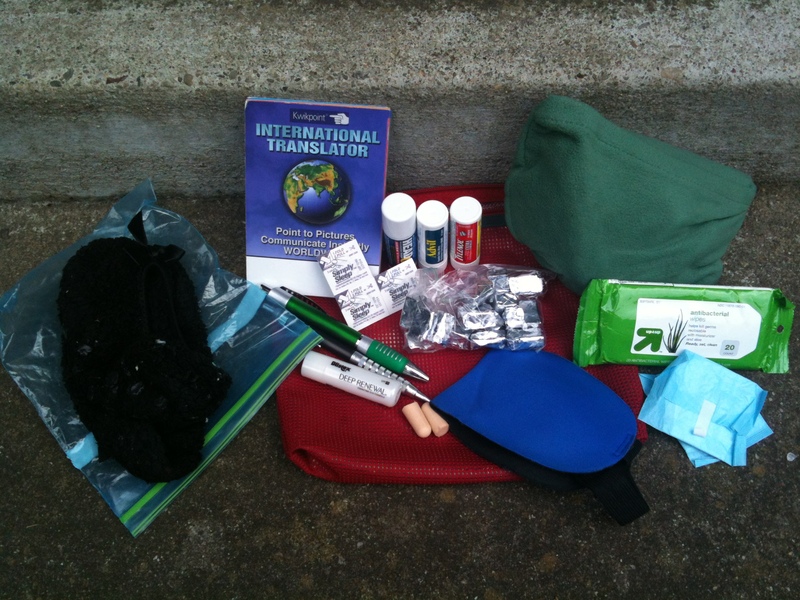 A few years ago I put together a comfort pack for my trips. The pack was small enough to slip into an airplane seat back pocket. That ensured that it was easily available and I didn’t have to go into contortions to get to it. I put the contents into in a bright red bag so I wouldn’t leave it behind. I’m a bit scatter brained as it is, and jet lag makes it worse. Simply sleep Benadryl in a blister pack so I can adjust to a new time zone. I already have this packed for my allergies and they work better than any sleeping pill. Why carry two different pills? Analgesics such as Head On, Advil and Tylenol – I have a couple of herniated discs in my back and this keeps the muscles from going in to spasms (too much). Chewable Zicam Zicam crystals to keep any potential colds in check. This is superior to the chewable versions and the tablet versions. They dissolve quickly in the mouth and are not susceptible to crushing. Pre-moistened wipes for those wonderful sponge baths in the bathroom stall. Mini-pads because travel throws everything off. Wisps – I’m not totally sold on this. It’s kind of wasteful. I decided to stick with the toothbrush in my toilet kit instead of Wisps. Is there anything you would put in a travel pack? Many travelers also like to have a sleep mask and ear plugs available. Thanks Kris, If you take a peek, it is embedded in the list. Frankly, I consider those two items some of the most important things I could take! Oops! I totally missed them! Again, a very impressive list. A snack, it’s a must for me. Preferably something homemade and granola bar-like. Just in case you’re hungry before or after a meal/flight. Can’t live without hand lotion on a long and drying flight. Nail file. A nail always breaks. Ipad for reading material. Just found your blog and love it. I’ve been a one bag girl for a while, but I’ve learned from you anyway. An Emory board for sure! I use my iPhone for everything so rarely carry computer.